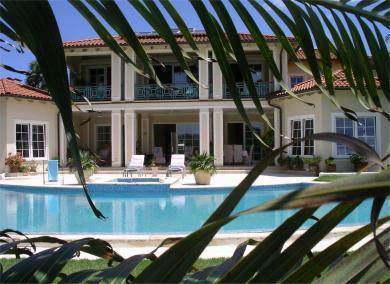 Villa Lucy is georgious! 650sq meters of house, set in 2450 sq meters of beautiful grounds like a jewel in the Caribbean, Set in a very safe, and exclusive gated community just moments from one of the most beautiful beaches in the area. This four bedroom, four and a half bath home has a huge pool, patio and dining area, three car garage and home movie theater. It is the last word in elegant living and is being offered fully furnished, with the staff waiting to greet you.